In an ideal world this post would include a recipe, rather than just a link, for cassoulet– the classic French bean dish that I have yet to make. 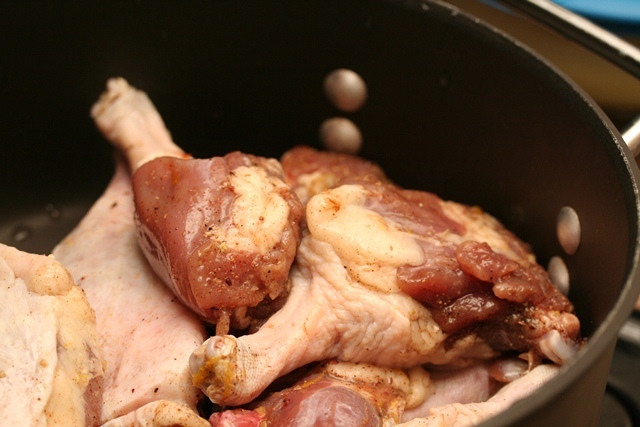 I’m half way there – yesterday I made duck confit – duck legs preserved in fat; an essential element of cassolet. But while I’m excited about what I have done this month for Charcutepalooza, skinning and boning a duck for roulade, rendering duck fat, and making the confit, the cassoulet will have to wait. An old friend I haven’t seen in five years arrives for a weekend visit tonight with her daughter. And someone very close to me goes in for important surgery next week. I’m saving the duck legs for her recovery. It’s going to be a celebratory cassoulet for a Sunday dinner sometime soon. I’ve got a lot of hope pinned to those duck legs. This month has been a whirlwind as I learn a new neighborhood, and to navigate the Emerald City from a different angle. Amidst the devastating news of my friends’ diagnosis there have been lots of good moments: my oldest friend came to stay for a week – we canned tomatoes and worked on our bread making skills. Mishka and I are back in Nosework, and I can’t say how happy I am to find that many of the threads of my old life are still in place. But I have felt constantly short of time – especially time to write. But as is my wont in times of stress, I’ve been cooking up a storm, (pies, cookies, canned spicy plum sauce, homemade nutella) and putting all my Charcutepalooza skills to use. I’ve made bacon; I’ve smoked a salmon, started a batch of sauerkraut, and I two duck breasts are curing in the basement right now. I’ve ordered more casings for sausage. After last month’s disappointing pate experience, it’s reaffirming to realize that so much of what I’ve learned from the project has become a way of life. And the duck roulade, made almost exactly as specified in Charcutiere (I left the liver out and cooked it for my very, very lucky dogs. ), was really something special – and economical. One duck served eight people. 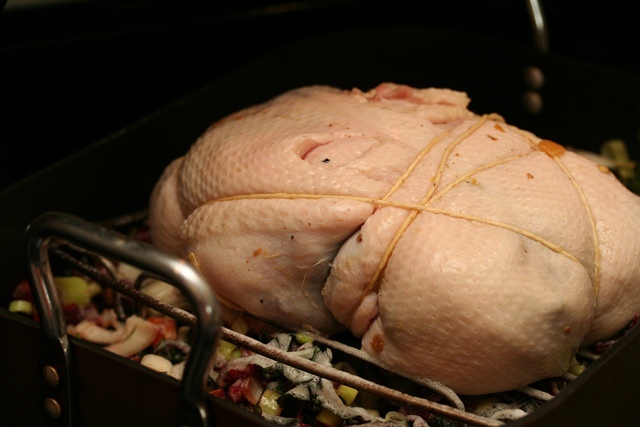 Did I enjoy scrapping the fat of the skin – no, but getting the skin off the duck in one piece – that really was fun, and I came very close , with only one easily patched hole. 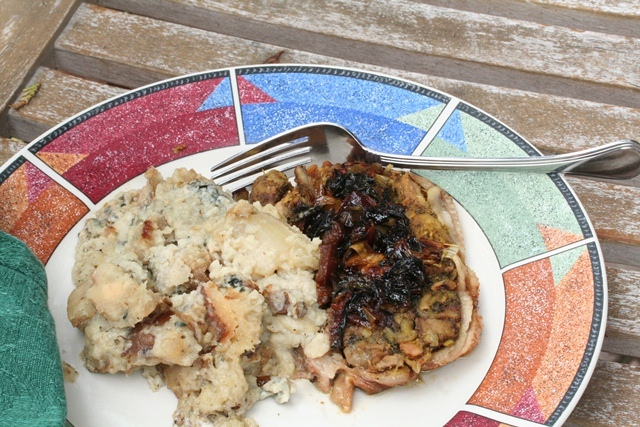 Served with K.M.’s blue cheese potatoes and on a bed of roasted vegetables, it was a lovely dinner. Succulent is actually the best word I can come up with. 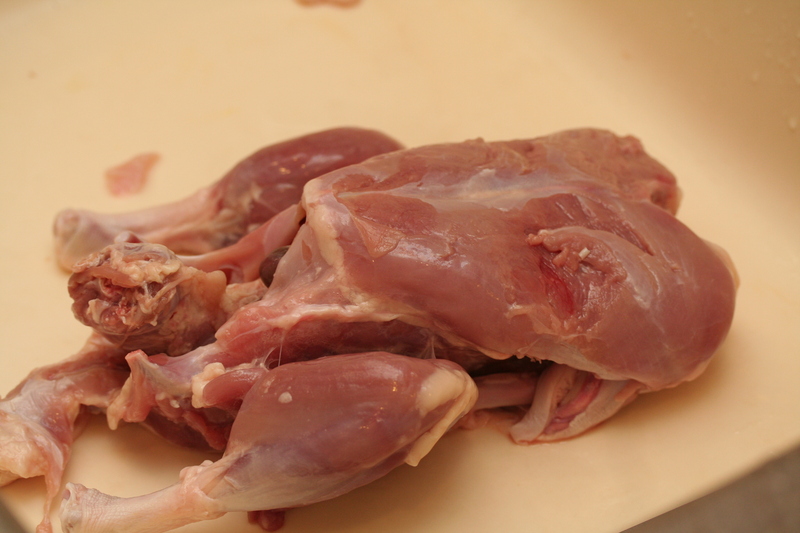 I’ve been saving duck legs and duck skin for quite a while in anticipation of confit and cassoulet. My freezer is a pretty intense place – between Charcutepalooza and the bulk meat buys I participate in to feed the dogs, K.M. won’t even open the door anymore. If you think your partner has weird hobbies, take heart, it could always be worse. I had no idea how easy it would be to render fat from duck skin. 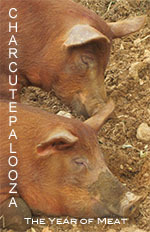 Ruhlman and Polcyn’s method worked like clockwork. Cover the skin with water, simmer for a few hours; just until the water has evaporated and all that remains is liquid gold. I had just enough to cover my duck legs for the long night’s low temperature roast which transformed them into confit. And now the legs will wait in the refrigerator, till I have time for them. Next week, I’ll be cooking for my friend’s children, freezing easy meals ahead, and doing what I can to ease her recovery. And of course, researching cassoulet. 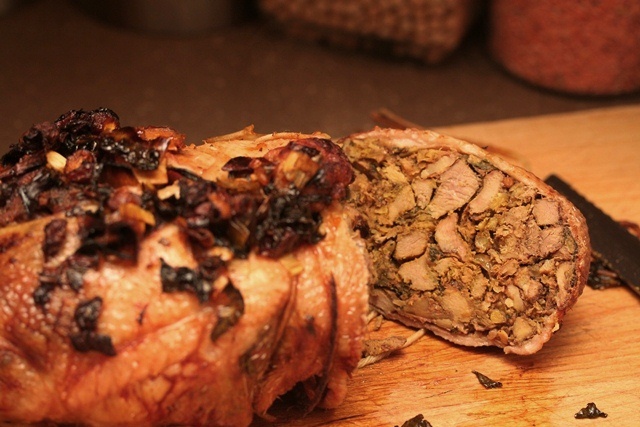 Wow – I love that you kept the “duck shape” with your roulade! I love that this meal is so economical, stretching so far and making so many different components! Nice work!